My first encounter with Ellen Potter’s writing was with her delightfully whimsical Olivia Kidney series, so I was interested to read this series geared toward early chapter book readers. 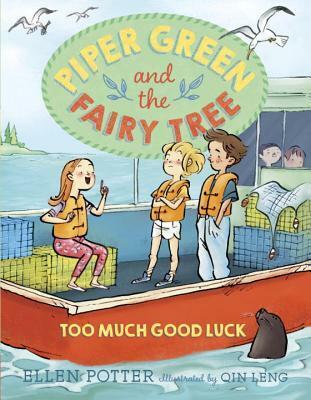 It follows Piper Green, a second-grader who lives on Peek-a-boo Island in Maine and takes a lobster boat to school. Once island children reach eighth grade, they head off to boarding school on the mainland. Piper’s older brother has just made that jump and she misses him so much that she insists on wearing his monkey earmuffs. Every single day. Piper’s new teacher does not appreciate this, and Piper decides she simply won’t go to school. While she is hiding from her mother, her neighbor, Mrs. Pennypacker, tells her all about a fairy tree in her yard. If you leave a gift for the fairies, they will leave a gift for you. Piper is a delightfully authentic little girl, just trying to cope with change to the best of her ability. Skipping school isn’t an act of defiance; it’s simply the best option she can come up with when her teacher tells her not to come to school wearing her beloved earmuffs but she can’t bear to take them off. Adults around her discuss the seriousness of her action, but they are also wonderfully supportive and understanding. 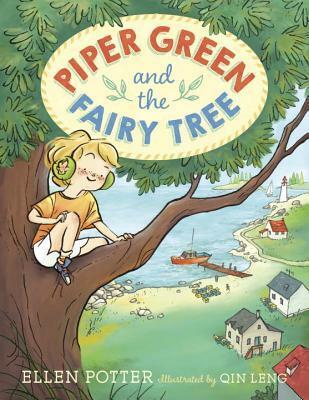 The remote island, the fairy tree–it’s all very magical, and by the end, Piper will have found a way to enjoy second grade, with some help from fairies and her family. Lilah and I were both charmed by the story, enhanced by Qin Leng’s sweet illustrations, and immediately turned to the sequel. Lilah and I were both eager to see what Piper is up to this time, and it’s a doozy. Piper is such a realistic little girl, not perfect, but not mean-spirited, and she sometimes makes big mistakes. When she has a run of good luck, she starts to worry that bad luck will soon follow, and it does, in the form of a new student who is allergic to the class rabbit, Nacho. 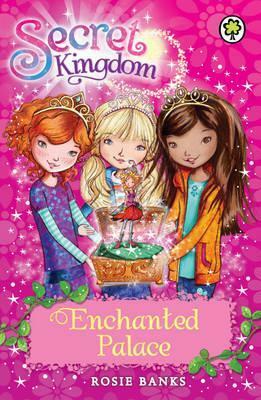 Piper adores Nacho, so she decides to loathe the new girl, Camilla, and tells her a horrible story that their teacher is actually a witch. (“Oh, Piper,” Lilah said at this point. “That is just not okay.”) Her parents make her apologize (while sympathizing with how much she misses Nacho – that’s something I love about the adults in these books – they listen) and the fairy tree helps her in an unexpected way. The magic of the remote island setting (Camilla lives in the lighthouse) is charming, and the fairy tree provides a touch of the supernatural without giving Piper solutions to her problems outright. She lives in a supportive community (the lobster boatman who takes the children to Mink Island to school every day has a wife who sends baked goods for them every morning, for example). Her parents don’t just yell at her when she behaves…well, like a child. They listen and understand (though note that they still made her apologize when it was called for) and try to help Piper deal with her emotions. She’s navigating childhood the best she can, and she’s charming while doing it. 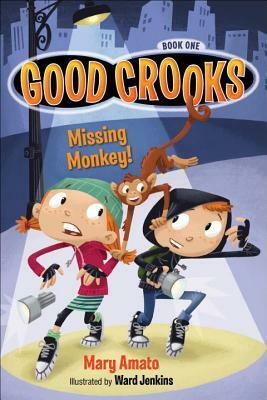 Lilah and I might have liked this second book in the series even better than the first, and we look forward to more. Lilah and I really enjoy Lulu, a seven-year-old girl who loves animals. This early-chapter-book series features a different animal in each entry, with Lulu’s good intentions causing mayhem that’s resolved by the end. It’s a bighearted series, and though Lulu is naive, she means well, and she cares deeply about animals. Information about animal care is included in the books, and Lulu does her research so she can effectively care for each new kind of creature. The charming drawings by Priscilla Lamont are always sweet and often hilarious. 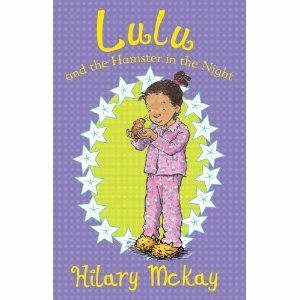 In LULU AND THE HAMSTER IN THE NIGHT, Lulu rescues a neglected hamster from a “big girl” at her school, Emma Pond, who (like everyone) knows of Lulu’s animal rescue efforts and offers the hamster to Lulu. Since the alternative is Emma releasing the hamster into the wild, Lulu takes the hamster and immediately begins his transformation by improving his living conditions and conditioning him to accept kindness from humans. In the middle of this socialization process is Nan’s birthday. What Nan wants for her birthday is a slumber party with Lulu and her cousin Mellie. Nan doesn’t like hamsters. And she has three cats. But Lulu is reluctant to leave Ratty at home, so she sneaks him to Nan’s, disguised as a present. But Ratty escapes, leaving Mellie and Lulu to track him down before the cats do and without Nan finding out. I enjoy reading Lulu stories out loud, and this was no exception. Lilah and I laughed quite a bit during this installment, which has the girls trying to find a way *inside* a wall, a suspicious neighbor calling the police, and trying to act casual around Nan despite their panic. The birthday party for Nan is lots of fun, with both the girls and Nan using their imaginations to create a memorable occasion. Lilah and I give this one all our thumbs up. 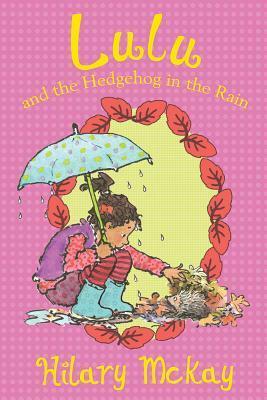 LULU AND THE HEDGEHOG IN THE RAIN has Lulu rescuing a wild hedgehog swept down the gutter by a heavy rainfall. Mellie expects Lulu to keep the hedgehog as a pet, but Lulu explains that she’s a wild animal. She makes a shelter in her garden and puts out food, but one day, the hedgehog starts trying to dig into the neighboring garden. The problem is that Charlie, who lives next door, never remembers to shut the garden gate, so Lulu is worried that the hedgehog will come to harm. And what if the hedgehog wanders into the garden beyond? She recruits several neighbors to join her Hedgehog Club, and they divvy up tasks to keep the hedgehog safe but still wild. When everyone else eventually loses interest, all the work falls to Lulu, but she perseveres. Lulu is passionate about helping animals. She volunteers to take on extra chores to enlist her neighbors’ cooperation to protect the hedgehog, she reads up on hedgehogs in a book from the library and uses this knowledge to discourage the New Old Lady from putting out bread and milk, which make hedgehogs sick, and she doesn’t attempt to keep the hedgehog confined, no matter how much she worries. Lilah and I both enjoyed this book. 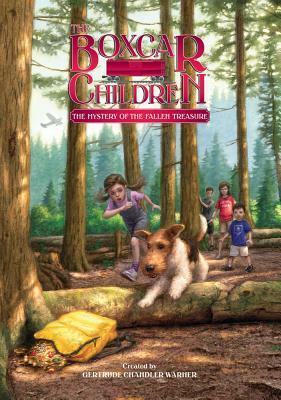 This was Lilah’s first Boxcar Children mystery, and she really enjoyed it. It was a fun nostalgia trip for me, and it was fun to share it with her. The dog, Watch, is being trained as a Search and Rescue dog, and on one of his outings, he finds a backpack with jewelry in it! The Alden children must return the jewels and find out who the real thief is to clear their friend’s name. Honestly, these are all the same. This is #132, and I’m not sure much distinguishes it from the others. These are cute, easy mysteries for the middle-grade set, and they’re just as fun as they were when I was a kid. I always enjoy the way the siblings work together and rely on each other. MISSING MONKEY! is the first title in this series by Mary Amato. 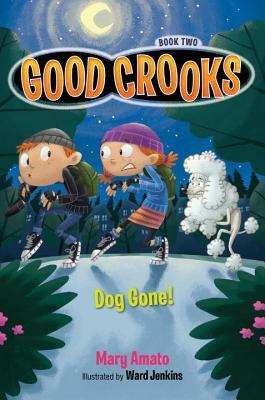 Billy and Jillian Crook just want to have a normal life and do good deeds, but their parents are crooks! After their parents steal a monkey to pick pockets for them, the siblings jump into action, donning disguises to return the monkey where he belongs. This is a high-interest early chapter book that would be great for reluctant readers. Many ridiculous antics cracked Lilah up, including monkey fingers up a nose. 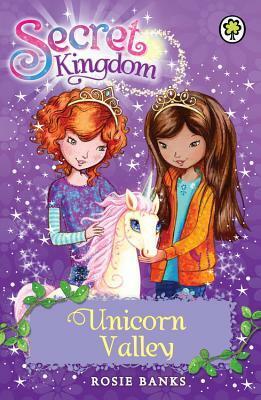 It’s a fun, light read with a nice message about the power of sibling love and the need to be true to yourself. The Crooks are at it again! While Jillian and Billy hold a bake sale to raise money for the animal shelter, their parents steal a spoiled Hollywood poodle to hold it for ransom. The kids going out in disguise (as old ladies) is hilarious, and of course, everything goes wrong when Jillian and Billy try to do right. Another fun entry in a high-interest early chapter book series. Lilah and I both had a blast reading this one. I read this book aloud to my six-year-old (at the time) daughter, and she loved it. As far as read-alouds go, it didn’t hold as much interest for me as other series, but she could easily read it herself (we alternated reading chapters to each other), and she adored it. Emma desperately wants a pet she can cuddle, but her mom is allergic to fur! What to do? 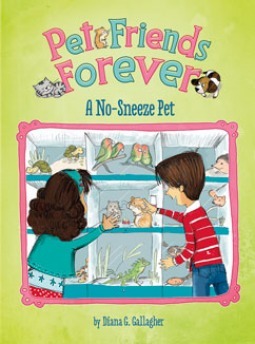 Emma’s best friends, Mia and Kyle, take this as a challenge and visit a pet shop, veterinarian, and other friends to find the perfect pet for Emma and her mother. There are interesting animal facts scattered throughout that my daughter really liked, and Mia and Kyle’s determination to help their friend is charming. They don’t give up easily, either. Faced with discouraging information, they soldier on, adjust their approach, and refuse to give up. The messages of friendship and determination are lovely. I also thought the focus on a pet that would work for Emma and her mother was excellent. Emma doesn’t dwell excessively on wishing her mother’s allergy away: she and her friends accept it as a given and look for a solution that takes it into account. Recommended for early chapter book readers with a love of animals.